Our challenge at Terrible Minds this week: the picture below. It was our inspiration, 1000 words. Couldn’t do it in 1000, but it’s not much longer. Enjoy. It seemed at the time a thoughtful gift. Well, not to me, considering I had no use for dolls. But I remained polite when my elderly grandmother, nearly blind, passed me the box. It wore velvet green Victorian garb, its curly brown locks in contrast with its porcelain skin, and brown eyes bright. I set the porcelain doll aside, thanked my grandmother, and made our tea. That night, I searched the living room high and low for the doll. Found it on my kitchen table, peering out the window. My grandmother must have placed it there before leaving, although I hadn’t seen her do it. In fact, I was surprised she had managed to find her way into the kitchen without help. I left the doll downstairs while I slept. While innocent in guise, something about it bothered me. I thought it was a dream when I woke to find the doll on my night table, illuminated by the projected time, meant to shine on the ceiling, but instead glowing 3:01 on the doll’s velvet gown. I jumped out of bed and stared at it, wondering if either I was going crazy or maybe sleepwalking. Had I brought it with me and not realized it? It was times like this when I ached for company; at least another occupant in the house might be able to substantiate the soundness of my mind. I grabbed the doll, light in my hands, and carried it to the office. I closed the door, and then closed my own door. I also pushed a pile of clothes in front of it. If I tried opening the door in my sleep, I’d know it when I woke up. At five in the morning, half awake, I turned the doll sitting on my bedside table towards the wall. I didn’t want it watching me while I slept. At seven, when my alarm went off, it was there, staring at me. I could remember turning it around to face the wall, but had not realized I was doing it. I’d thought it was a dream. My heart began to pound as I glanced at the bedroom door, found it closed, found the pile of clothes still lying in front of it. I glanced at the doll. She watched me with that pleasant smile on her face, expressionless otherwise. I snatched her by the head now, kicked the clothes out of the way to get out, and brought her to the garage. I set her on the workbench in front of the window, left the garage, and locked the door. Exiting the shower, I nearly slipped and fell when I jumped in fright. The doll sat on the vanity counter, facing me. I wish I’d had someone to blame. My fear of dolls began when my grandmother bought one—very similar to this—for me back when I was seven or eight. I didn’t like the doll facing me while I slept, so I would turn her to face the wall. My brother had found it hilarious to sneak into my room, night after night, and turn the doll back to face me. I didn’t know he was doing this until I nearly had a nervous breakdown, believing my doll was haunted. Now, my brother lived hours away, so I couldn’t blame him. The doll was following me around and could somehow walk through walls. This doll really was haunted. Without dressing, I grabbed the doll and threw it into the hallway. I locked the door and brushed my teeth. I wiped the foggy mirror with my towel so that I could apply my makeup, and there in the mirror, sitting on the shelf behind me, was the doll. I screamed in aggravation and fear, charged at the thing, and tried to wrench the head off. It was harder than I thought it would be. When I didn’t succeed, I chucked it head first into the toilet and left it there, so that I could watch it, and sat on the floor by the door, rocking back and forth in fear. What was I going to do with this thing? Chop it up with a chainsaw? My dad had one. Maybe throw it in a wood chipper? Sitting here on the floor, I saw a black sock sitting behind the toilet. My heart wrenched and faltered. I let out a sob. I thought I had rid the house of his clothes, but no matter what I did, I always seemed to find little mementoes of his having been here, a part of my life for so long, but now gone forever, thanks to that tanker truck. I couldn’t even think the words. I had gone back to work too early, but the place was falling apart without me. Now, I was working twelve hour days, six days a week, mourning the death of my fiancé, and a haunted doll was following me around. I didn’t need this. The doll hadn’t moved. Satisfied, at least for the moment, I stood up and finished getting ready, cranking the music in the bathroom to distract my thoughts from not only the doll, but from my fiancé. Because time had somehow slipped by me, I decided to leave the doll in the toilet. I don’t know what prompted this action, but I figured it hadn’t moved since I put it there, and I had a washroom downstairs I could use. As I was leaving the house, I glanced in the mirror to check my hair. That was when I saw the doll cradled in my left arm, soaking wet. My shirt was wet, pants, too. I screamed and threw the doll to the floor, refusing to believe the only thing that seemed possible. It had somehow climbed in my arms; it was stalking me. I ran out of the house, locked the door, and hurried to the car. For the next week, no one mentioned the fact that I carried a porcelain doll around with me everywhere I went. They thought I knew, thought it was a joke, thought all sorts of things. By the following Monday, someone had called my parents down in Florida. My room here at the hospital is nice. The plain white walls make a great backdrop for all the colour. And here, I’m never alone. The dozens of glass eyes staring back at me are a comfort. They wear dresses of all shades of the rainbow, in all different styles of clothing. I don’t make them face the wall when I sleep. They are beacons of light, hope. They’re my protectors, my guardian angels. I even have one that looks like my fiancé. That one I keep close to my bed. The doctors say I’m making progress. I now know that the dolls aren’t the haunted ones. Geez. Now I'm going to wake up several times a night, checking for random doll appearances. Thanks a lot. Anything I can do, :)! That was my life for years and years, and my brother really did try to terrify me with my own porcelain doll, once he knew of my fears! Oh, great. I'm thinking I should of read this during daylight hours. S'cuse me. I gotta go check and make sure the granddaughter took her Barbie home with her. Imagine, I dreamed of this stuff 1-5 times a month for almost ten years! Bring it on 😀 ! Dolls that move "by themselves"- one of the few "impossibilities" which truly frighten me! You and me both! And honestly, this story wasn't nearly as frightening to me as my dreams were back then. 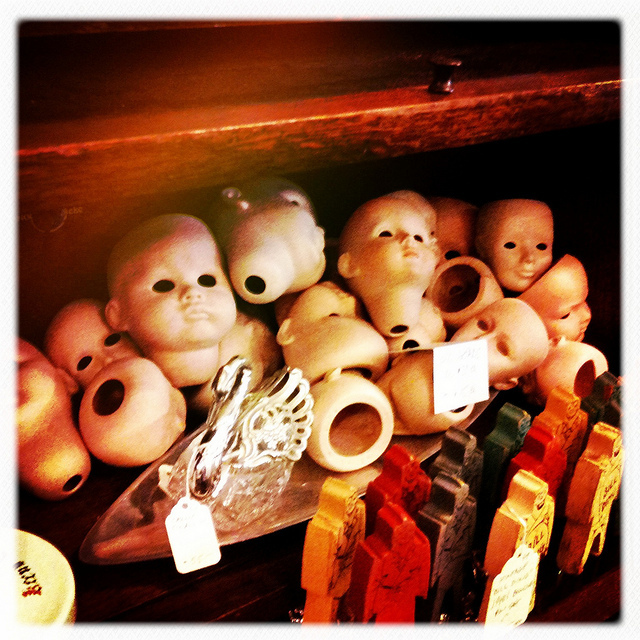 In the dreams, the dolls really did move, speak to me, all sorts. I just wish I could have remembered what they said.